The Observer Corps was formed in Arrochar during WW11 to plot all aircraft, friend or foe that flew over the area. A listening post was set up on the hillside between the Torpedo Range and the Ashtree Burn. It composed of a turf outer ring wall with plotting instruments on a pedestal inside and a make shift shelter for sitting in. This was manned night and day by shifts. Any aircraft flying over were plotted out to the adjacent area and also the Area Headquarters in Oban. It was not a very comfortable situation for the observers although they managed to fit up a brazier to help keep warm, bringing the coal and logs up the hill on their backs. I only remember two who manned the post, John MacKenzie from Rossmay and Donald MacLachlan from Arrochar House Cottage others were involved but their names escape me. After the war a new post was built on Cruich Tairbert just below the Cairn above Arrochar where weekend exercises were carried out. The RAF and Navy used to fly aircraft over for us to plot day and night we also had to identify type, speed and direction of the flight. A few of the younger people of Arrochar got involved in the Corps, some joined after they came home from completing their National Service. There was an annual exam/test held in Oban, which our group had to attend. Arrochar nearly always came in the lead in aircraft recognition. Later on when the cold war started the system was changed to plotting of nuclear incidents, at this point a new underground bunker was built at Succoth where you had to live in if any incident occurred. It was not very comfortable but a good place for growing mushrooms!! 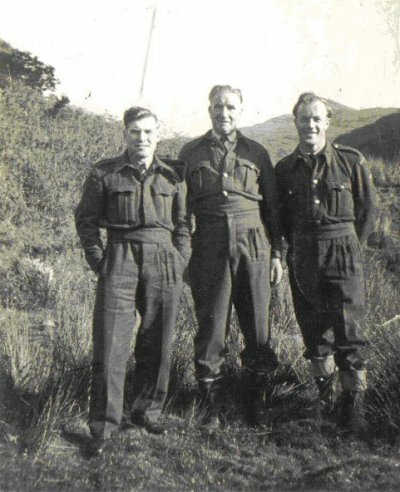 Tommy Lindsey, Jock MacKenzie and Arthur Ross at the post below the Cairn in the 1950's. An annual camp was held at once a year at an airbase in England. Courses on identifying aircraft and plotting of nuclear explosions and fall out were held. This was the highlight of the volunteer’s year. The Corps were finally disbanded when more modern methods of plotting were introduced.